If you studied economics at some point you most likely learned about Adam Smith. He's often revered as the Father of Modern Economics, but could it be that project managers could learn more than economics from Adam Smith? Is it possible that his lesser known book The Theory of Moral Sentiments, published in 1759, could help us become better project managers and leaders? 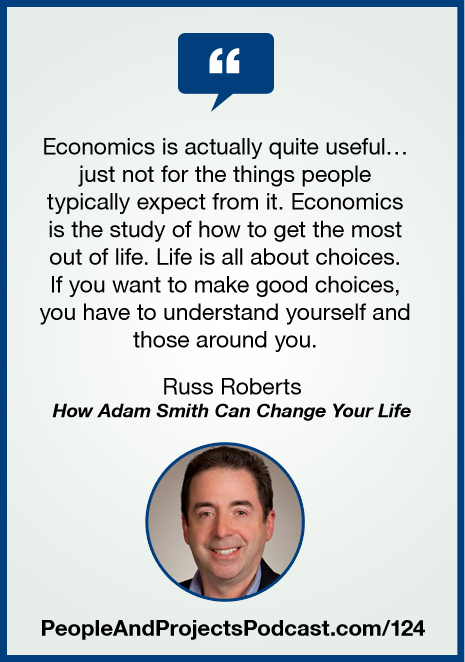 My guest today is Russ Roberts, author of How Adam Smith Can Change Your Life: An Unexpected Guide to Human Nature and Happiness. I'm a big fan of Russ' EconTalk podcast, and I think you're going to find his new book about Adam Smith very intriguing! Please e-mail me (show [AT] PeopleAndProjectsPodcast [DOT] com or leave a message on our Listener Feedback Line (847-550-3747), letting me know what you think about this conversation with Russ. How do you implement these ideas? What questions do you have? I look forward to hearing from you!